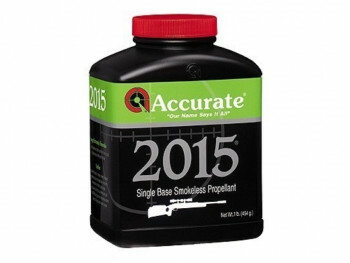 Accurate 2015 is a fast burning, single-base, extruded rifle powder that performs very well in small to medium varmint calibers (223 Rem, 204 Ruger). 2015 is a popular choice for first-class performance in benchrest calibers and is also recommended for use in large bore straight wall cartridges (45-70, 458 Win Mag). 2015 offers excellent ignition characteristics and shot-to-shot consistency. Made in Canada.